Replacing carpet with tile in a room is a costly affair. If one area of your carpeted room is damaged or dirty, there is no need to replace the carpet in the entire room. Instead, cut out the damaged section of the carpet and replace it with tile. The effect is that of a reverse throw rug, with an island of tile surrounded by carpet. Figure out how much of the carpet you want to remove. Mark this off with a piece of white chalk and a straightedge. Do not cut the carpet yet. Determine the area of the section of carpet you want to cut out. To calculate the area, multiply the length of the space times the width. For instance, if the long sides are twelve feet long, and the short sides are five feet long, multiply the length (12) times the width (5), to get the area (60 square feet in this case). Purchase tile that will fit in the area that you need to cover. If it's impossible to get the area covered exactly, you need to decide whether you want to make the section bigger or rent a tile cutter. For example, if the area is 49 square feet, measuring 7 feet by 7 feet, and the tiles you find are 18 inches each, then each side will need 4.66 tiles. Decide if you want to use 5 full tiles instead, making the area 56 1/4 square feet, or if you'd rather rent a tile cutter to make the tiles fit the 49 square feet. Pull the carpet away from the nearest wall, and roll it until the area to be covered by tile is exposed. 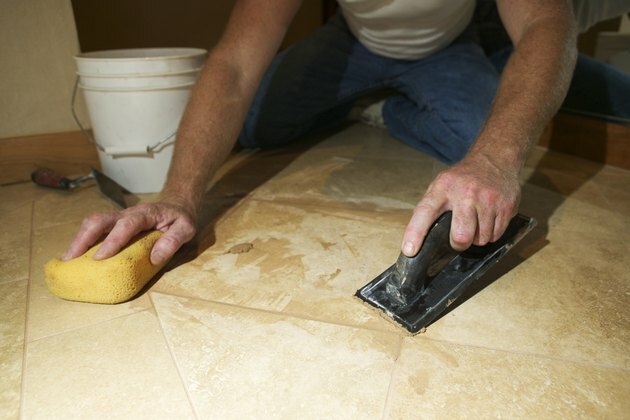 Scrape and clean the sub-floor and allow it to dry completely. Apply tile cement and set the tiles. Use tile spacers to get the spacing correct. Allow the tile cement to dry completely. Grout the tile according to the instructions on the package. Allow the grout to dry completely. Roll the carpet back over the tiled area. Use a straightedge and a box cutter or carpet knife to carefully cut the carpet flush with the edge of the tiled area. Finish the edges with carpet-to-tile transitions to avoid carpet fraying.